Yesterday I found an old zinc plate and decided to recycle using the reverse side. This side already coated in resist meant that it was calling out for a line etch, too large for hand done mezzotint but suitable for drypoint. However that was the theory, the practice was different. The original side upon which were twenty year old remains of the destroyed plate’s surface due to it being the surface of a limited edition. 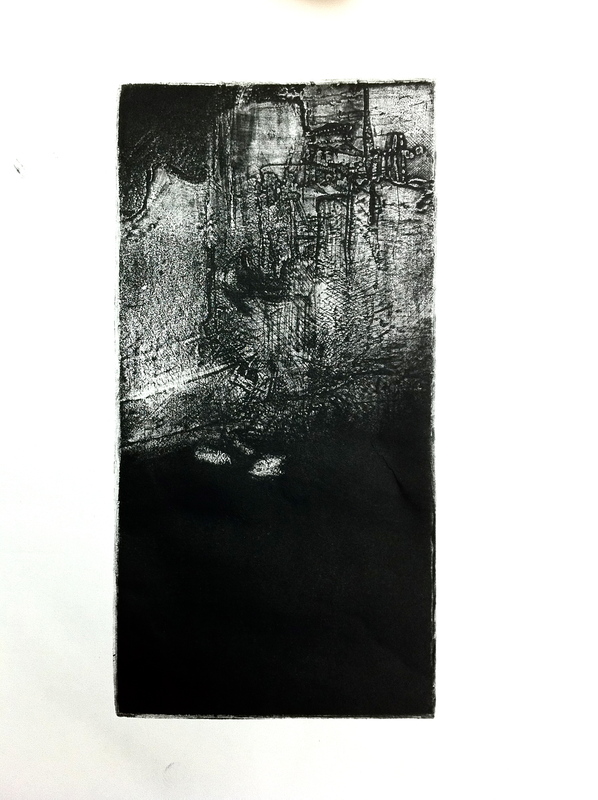 The surface texture looked very different turned upside down thanks to a fellow printmaker in the Anglesea workshop. We are most fortunate to have two printing presses at the Anglesea Art House and it was fortuitous that the fellow printmaker noticed the marks and texture of the ruined plate. 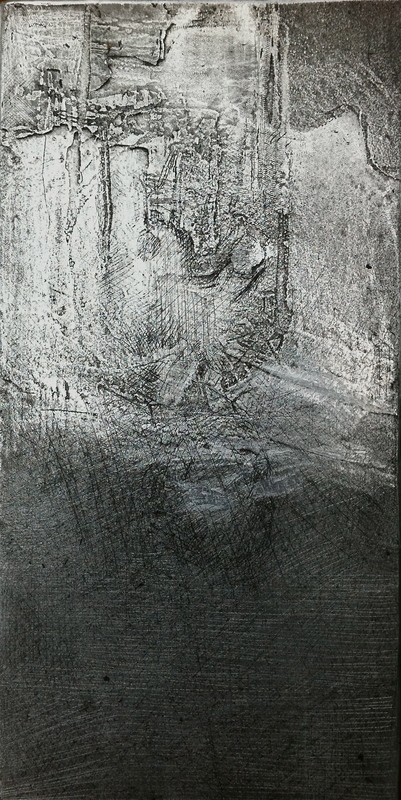 The top half of the plate already destroyed by open bite, burnish and drypoint balanced the drypoint bottom half. I printed a proof in black ink on Cartridge paper to gauge what imagery remained. The close up showed the amount of detail and mark making that reminded me of the subject matter in previous posts about my two commissions. This afternoon I saw not the rocks of Point Roadknight but the sides of Karijini Gorge. I recalled Dales Gorge and a particular rock sample at the base of the gorge. It was witness to early layering of red rust sediment thought laid down as oxygen slowly entered the atmosphere that caused the iron laden ocean to rust. The plan now is to burnish strata combined with red chine – colle as a way that may allude to an ancient at least 3 billion year old phenomenon. 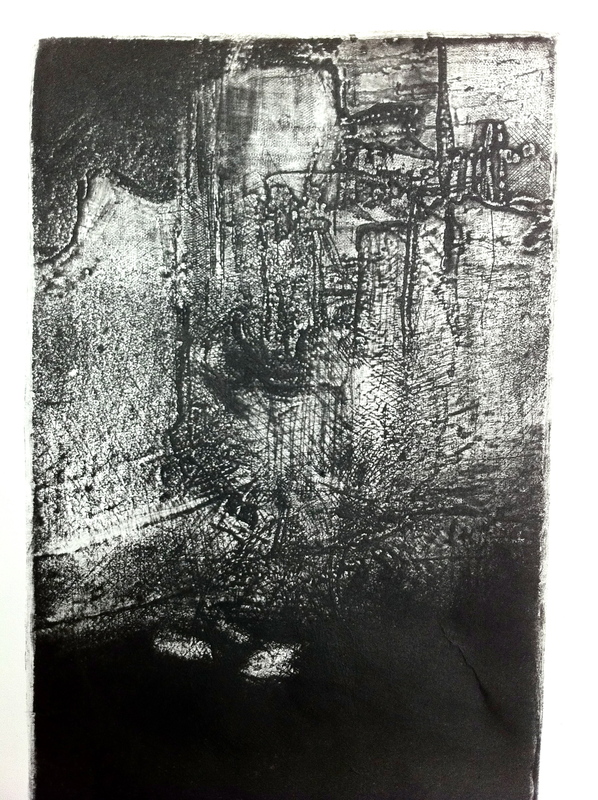 Categories: Prints | Tags: art, Australian printmaker, Etching, sedimentary strata | Permalink.